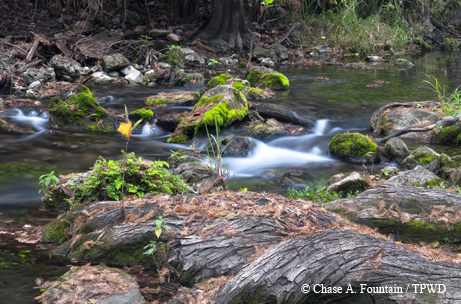 ﻿﻿﻿﻿﻿﻿﻿Guadalupe River State Park offers history, culture and abundant wildlife. 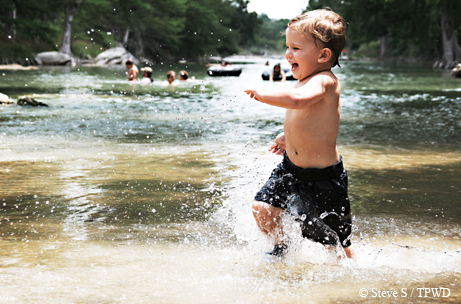 Like butterflies to nectar, visitors by the tens of thousands are drawn to the pristine, cool water of the river that flows through the heart of Guadalupe River State Park. On any given weekend, the banks of the Guadalupe — and the river itself — are inundated with families and other visitors, cooling their feet or taking a dip in its clear water. Recently, the Guadalupe River demonstrated its raw power as spring rains led to a Memorial Day weekend flood that sent the river surging out of its banks. Thanks to a three-week effort of staff and volunteers after the flood, the day-use area has been cleaned up and repairs made. While the Guadalupe River has returned to its channel and is certainly a primary attraction, visitors quickly discover there is much more to this state park. For those looking for a hiking experience away from the crowds, consider heading to the 670-acre Bauer Unit. Located north of the river, this section of the park has six miles of trails that wind through fields and woodlands. The Bauer Trail leads to a less-visited stretch of the river. There, you can fish the deeper pools for bass or catfish, take a dip or rest on the roots of a towering bald cypress, watching the water flow over the rocks, carrying away the worries of the day. For bird-watchers, the Bauer Unit provides the best opportunity for hearing and seeing the endangered golden-cheeked warbler. Walking the trails from late March through mid-May, it’s not unusual to hear a chorus of males, their buzzy songs emanating from the oak trees nestled in old-growth ashe junipers. For a guided experience, join the weekly interpretive hike through the adjacent Honey Creek State Natural Area. Departing from the Rust House, this walk weaves together the cultural and natural history of the area. Along the way, you will descend to the banks of Honey Creek, a spring-fed stream nestled in a canyon where towering bald cypress and sycamore trees stretch to the sky. You will be treated to the crystal-clear water of this mile-long stream and the songs of birds intermingling with the occasional clicking of diminutive cricket frogs. The adjacent Honey Creek State Natural Area protects a spring-fed spring. To learn more about the birds, frogs and other wildlife of the park and Honey Creek, round out your visit with a trip to the Children’s Discovery Center, designed to encourage hands-on exploration. You and your children will find skins, skulls, skeletons and more among the thematic discovery boxes. Along the walls are exhibits where you will meet “eye-to-compound-eye” with close-up images of insects, discover what lives in the river and find out how our eyesight compares to that of a bee. The sound of a barred owl will draw you to the center’s nocturnal room, where you can discover the critters that come out after the sun goes down. Don’t forget to check out a backpack so that your children can continue their discoveries along the park’s trails. Guadalupe River State Park is located in Comal County, 13 miles east of Boerne and 20 miles west of New Braunfels, along Texas Highway 46. To learn more about the park, including information on camping, picnicking and the variety of interpretive programs offered, visit visit www.tpwd.texas.gov/guadaluperiver.